SPACEPORT NEWS October 27, 2006 Page 2 Awards The Kennedy Update Jim Kennedy Center Director I have participated in many exciting NASA events, but the upcoming STS-116 mission to the International Space Station will hold a very special place in my heart as it will be my last space shuttle mission while serving as your center director. The STS-116 crew recently visited the center and completed the Crew Equipment Interface Test with great success. The teamwork displayed by both the crew members and the employees who worked alongside them was another fine example demonstrating the best of our core values. Led by Commander Mark Polansky, the seven astronauts familiarized themselves with the tools and equipment they will need to rewire the station. For the past eight years, the station has been operating under a temporary electrical system. Using the newly attached P3/P4 solar array panels from the STS-115 mission, the STS-116 crew will conduct two spacewalks to switch the power to the permanent system. In other shuttle-related news, the dates for the first three launches in 2007 are being assessed by the team. Atlantis and the STS-117 crew are targeting launch no earlier than March 2007, followed by Endeavour and the STS-118 crew in June, and Atlantis and the STS-120 crew no earlier than September. Be sure to stay tuned for the latest mission updates as we continue to move ahead with station assembly. At the time of this writing, another exciting NASA science mission was scheduled to begin earlier this week with the launch of the STEREO spacecraft aboard a Boeing Delta II rocket from Launch Pad 17-B at the Cape Canaveral Air Force Station. Consisting of two identical spacecraft, STEREO will help scientists better understand how space weather impacts communications on Earth. As the worlds dependence on advanced communication technology continues to grow, NASAs research should help to provide guidance to the industry on how to avoid the major interruptions that can cost businesses billions of dollars each year. Many of the outstanding small and large businesses that help NASA accomplish so much participated in the Business Opportunities Expo 2006 held at Port Canaveral. As I walked through the vendor areas, I could sense the enormous amount of pride these business owners and employees felt as they talked about their work with NASA and their interest in contributing to the success of the Vision. And with the transition from shuttle to Constellation already in progress, we should certainly appreciate the valuable and innovative contributions of small business more than ever. I also highly value the contributions of our own work force, and I hope you were able to take advantage of the Stress Out Day that was offered to help you cope with the pressures that may come your way. Judging by attendance figures, a large number of you did participate in the event, and I am sure you picked up some excellent pointers on how to live a healthier lifestyle. Remember, the end of daylight saving time is this Sunday. With Halloween on Tuesday, it will certainly be dark earlier, so be sure to drive carefully when children may be present near roads.Atlantis and the STS-117 crew are targeting launch no earlier than March 2007. By Jennifer Wolfinger Staff Writer K ennedy Space Center workers have important and unique responsibilities weighing on them daily, so the Employee Assistance and Health Education and Wellness programs sponsored the first Stress Out Day on Oct. 19 to provide tips and methods to manage tension. Workers visited the Operations and Checkout Buildings mission briefing room throughout the afternoon to participate in several wellness activities. Participants could receive a quick massage, register for a meal-planning service, discover the benefits of feng shui, learn about business coaching offered by NASA, schedule a financial planning session, plan a vacation and so much more. Im here to learn how to relieve stress in my daily life, said Employees learn various techniques to avoid stress EMPLOYEES RECEIVE advice during the first Stress Out Day held Oct. 19 in the Operations and Checkout Buildings mission briefing room.the Procurement Directorates Jaime Dempsey. Im really excited about getting a massage so I can return to work recharged. Many employees were brave enough to try new experiences. The center of the room was filled with dance instructors teaching employees new ballroom and jazz moves. Some participants even tried acupuncture, a Chinese healing technique that involves inserting needles at specific body points. In the beginning, you can feel some twitching from the needles, and some more than others. Then it became very relaxing. Its weird, because I wasnt expecting it to really work and I wouldnt mind doing it again, said Rosaly Santos-Ebaugh, a Center Operations employee who tried acupuncture in her ear to eradicate stress. Attendees competed for eight door prizes and early birds received miniature golf coupons. But for some employees, the knowledge they gained was more exciting than tangible gifts. I learned many techniques to relieve stress, and also that Human Resources will help organize your office, said Janice Everett of Center Operations. This was a very good event and an eye opener. I got to meet new people, discover interesting concepts, and Im glad I attended. The Stress Out Day team would like feedback from participants. Please e-mail input to Lauren.Ratner@jbosc.ksc.nasa.gov . SPACEPORT NEWS Page 3 October 27, 2006 Myers proud of Society of Women Engineers award HARMONY MYERS was honored with the 2006 Distinguished New Engineer Award from the Society of Women Engineers. T he Society of Women Engineers recently named Kennedy Space Center employee Harmony Myers a recipient of the organizations 2006 Distinguished New Engineer Award. Myers was recognized for her contributions to ensure the safety of the space shuttle, for local and regional leadership in the Society of Women Engineers (also known as the SWE), and for providing guidance and support to the groups collegiate members. Myers is a reliability and safety engineer for NASA. She implements and manages program and project safety initiatives for government and contractor activities. She also assists in making safety decisions for the shuttle program, as well as reviewing and managing government contracts to ensure safety requirements and procedures are met. Harmony has demonstrated a breadth of problem-solving and leadership capabilities throughout her safety and reliability initiatives for the space industry, said Jude Garzolini, president of the SWE. These skills are imperative for success in the space program, where safety and reliability are paramount. Myers began her engineering career as a telecom engineering coop at Harris Corp., where she researched wireless service capabilities through the Harris Headquarters. Myers later took on the role of sensor IPPT engineering intern at Lockheed Martin Co., where she researched cameras, heat detection, voice detection, satellites, television and other equipment to implement into military vehicles. Myers then worked for United Space Alliance at KSC for five years. During this time, she was a system design engineer on the integrated electronics assembly for the solid rocket booster, and a shuttle reliability engineer who performed analyses for the shuttle program. In addition to her professional responsibilities, Myers has been very active within the SWE for nearly 10 years. Myers has made some significant accomplishments during her short career. She was the recipient of the Quest Performance Award in 2002, named Central Floridas Young Engineer of the Year in 2003 and National SWE Nominee for New Faces of Engineering in 2006. The Distinguished New Engineer Award honors women engineers who have been actively engaged in engineering, demonstrated outstanding technical performance, and have had no more than 10 years of cumulative engineering experience as of Dec. 31 of the past year. Each advanced engineering degree obtained on a full-time basis counts as one year of experience. The Society of Women Engineers, founded in 1950, is a non-profit educational and service organization that helps to establish engineering as a highly desirable career aspiration for women. Bolger becomes director of Information Technology By Jennifer Wolfinger Staff Writer M ike Bolger left Indianas frigid weather to pursue his love for computer science through a NASA co-op position on the sunny Space Coast 22 years ago, and he has advanced to become Kennedy Space Centers Director of Information Technology and Communications Services. As director, he leads strategic planning for the organization, manages resource allocation, cultivates the work force, and represents the directorate with other center and agency stakeholders. Bolger also serves as KSCs chief information officer, or CIO. In that role, he ensures that KSCs asset acquisition and management follow federal policy and regulations. He also partners with the agencys Office of the CIO and other NASA center CIOs to guarantee KSCs IT policy and systems are aligned with the rest of the agency. Prior to his appointment, he worked in various technical, business and leadership positions. He developed shuttle processing ground software, managed software configuration for the firing rooms, helped lead the Checkout and Launch Control System project, managed the J-BOSC contract, supported the 2004-2005 hurricane recovery effort and performed a detail with the chief financial officer. Wherever Ive worked, Im proud of the positive relationships that Ive developed with subordinates, peers, contractors and senior managers as together weve established an environment of trust and accountability with one another, he shared. The in-place IT leadership team is experienced and savvy. The engineers, IT professionals and business support personnel are talented and enthusiastic. My real challenge is to be an effective advocate for all the great ideas that people have, said Bolger, who sees information technology becoming so integrated into our environment that it will seem transparent. The 140 government employees Bolger manages are working on several initiatives. The team is modernizing communication systems, developing new technology to support current programs and the Constellation Program, enhancing IT security processes across the center, strengthening the launch readiness process, improving contract surveillance methods and establishing ODIN as the desktop service provider of choice. As a teen, he quickly grasped computer programming when his dad brought home a computer. I soon recognized the power of being able to write a program that endlessly scrolled disparaging remarks about my brother, he joked. He spends his free time supporting Merritt Island youth sports with his wife of 13 years, Sami, and children: Alex, 11, Oliver, 10, and Anna, 6. He also enjoys golfing and fishing.MIKE BOLGER is director of Information Technology and Communications Services. Page 4 SPACEPORT NEWS Occtober 27, 2006 STS-116 crew participates in Crew Equipment Interface TestCEIT . .(Continued from Page 1)Making his shuttle flight debut is former flight instructor and member of the 1998 astronaut class, Mission Specialist Nicholas Patrick. Christer Fuglesang, a mission specialist from the European Space Agency, is also making his first shuttle voyage. Flight Engineer Sunita Williams will stay on the station with the Expedition 14 team after arriving there on Discovery. The crew members of STS-116 have been training long and hard for this flight, and their days at Kennedy will keep them sharp for the challenging mission ahead.For the latest updates on the STS-116 mission, visit http:// www.nasa.gov/shuttle INSIDE THE SPACEHAB Payload Processing Facility, mission STS-116 crew members inspect flight hardware during the Crew Equipment Interface Test. From left are Mission Specialists Joan Higginbotham, Nicholas Patrick, Sunita Williams and Christer Fuglesang, who is with the European Space Agency. Behind Fuglesang is Mission Commander Mark Polansky. FROM LEFT, at the Shuttle Landing Facility, Deputy Director William Parsons and Discovery Flow Director Stephanie Stilson greet STS-116 Mission Specialists Robert Curbeam and Nicholas Patrick after they arrive for the Crew Equipment Interface Test. FROM A platform in the Orbiter Processing Facility, STS-116 Commander Mark Polansky (left) and Pilot William Oefelein look at one of Discoverys reinforced carboncarbon wing leading edges. INSIDE THE SPACEHAB Payload Processing Facility at Port Canaveral, STS-116 Mission Specialists (from left) Joan Higginbotham, Sunita Williams and Nicholas Patrick look over flight hardware during the Crew Equipment Interface Test. STS-116 CREW members are briefed on the cameras they will be using during the mission. The astronauts are, from left, Mission Specialists Robert Curbeam and Christer Fuglesang and Pilot William Oefelein. Page 6 SPACEPORT NEWS October 27, 2006 NASA seeks input on Constellation Programs impact INSIDE THE Operations and Checkout Building mission briefing room, Ken Kumor (far left), the NASA National Environmental Policy Act (NEPA) coordinator, spoke to KSC workers about the Constellation Program NEPA process. The panel included John Connolly and Dr. Jennifer Ratigan, with the Constellation Program at Johnson Space Center, and Ruth Gardner, with KSCs shuttle ground operations. THE PANEL recently held a public workshop about the Constellation Program NEPA process at the Florida Solar Energy Center in Cocoa.By Linda Herridge Staff Writer W ith Constellation Program activities moving forward, NASA is pondering what kind of environmental impacts the development and launch of the Ares and Orion vehicles could have on the Earths environment. The agency is looking for input from space workers, the aerospace community and the general public in order to write an environmental impact statement for the program. As part of the agencys scoping process, Kennedy Space Center employees provided feedback on the impact statement on Oct. 17 in the mission briefing room at the Operations and Checkout Building. The public does have a stake in the environmental decisions that NASA makes, said Ken Kumor, the NASA National Environmental Policy Act (NEPA) coordinator and federal preservation officer. A limited number of long-lead activities that could affect the environment need to be initiated before the impact study can be completed. Separate NEPA documents will be required for the development of the Crew Exploration Vehicle Orion, the proposed NASA Launch Abort System Test Program, and proposed new construction and modification to existing facilities to support early testing of Ares-I and Orion at KSC. Alternatives to be considered in the impact statement will include other launch vehicle systems, other means to support the International Space Station and alternative Orion landing regimes and sites. Two scoping meetings were held at the Florida Solar Energy Center in Cocoa on Oct. 18, one in Washington, D.C., on Oct. 20, and one in Salt Lake City on Oct. 24. The public scoping period closes on Nov. 13. Potential environmental impacts to be addressed for the Constellation Programs normal operations and accident situations include air and water quality, plant and animal life, noise and vibration, historic and cultural resources, sonic booms and other Earth-return impacts, and socioeconomic factors. At KSC, potential environmental impacts include wetlands, floodplains, coastal zone management, the Cape Canaveral National Seashore, Merritt Island National Wildlife Refuge, migratory birds and marine mammals. Kumor said the input will help in creating a Draft Environmental Impact Statement that will contain suggested alternatives and the proposed mitigation measures. John Connolly, with the Constellation Program at Johnson Space Center, presented an overview of the flight vehicles, launch vehicles and mission architecture. Connolly said the combination of the new Orion capsule, its launch escape system, and the Ares launch vehicle will greatly improve the safety and reliability of NASAs crew launches. The heavy-lift Ares V launch vehicle will lift larger payloads into orbit than the Apollo programs Saturn V. Connolly said the exploration of the moon will include additional regions that were inaccessible during the Apollo program. We may revisit some of the Apollo sites, Connolly said. But we will also have the ability to explore newly discovered scientific sites such as the lunar poles and the South Pole-Aitken basin on the far side of the moon. NASAs STEREO to study space weather for two yearsAT PRESS time, launch of NASAs STEREO spacecraft was scheduled for Oct. 25 aboard a Boeing Delta II rocket from Pad 17-B at Cape Canaveral Air Force Station. STEREO consists of two spacecraft that together comprise the first mission to take measurements of the sun and solar wind in 3-D. This new view will improve our understanding of space weather and its impact on the Earth. During the two-year mission, the nearly identical spacecraft will explore the origin and interplanetary consequences of coronal mass ejections. 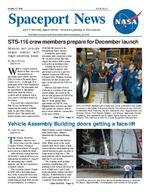 SPACEPORT NEWS October 27, 2006 Page 7 Remembering Our Heritage GEMINI 12 astronauts James Lovell Jr. (right) and Edwin Aldrin Jr. are seated on a mockup of the Gemini spacecraft. BELOW, NASA astronauts James Lovell Jr. (left) and Edwin Aldrin Jr. receive an official welcome as they arrive aboard the aircraft carrier U.S.S. Wasp after their splashdown Nov. 15 at the end of the Gemini 12 mission.By Kay Grinter Reference Librarian U .S. Navy Capt. James Lovell and U.S. Air Force Major Edwin Buzz Aldrin observed Veterans Day in 1966 in a way other members of the armed forces could only envy: launching into space atop a Titan II rocket on the 10th and final mission of the Gemini Program. Commander Lovell was making his second space flight following Gemini 7 with rookie pilot Aldrin, an expert in orbital rendezvous with a doctorate in astronautics from the Massachusetts Institute of Technology. Their mission was rendezvousing and docking with an Agena-D target vehicle and performing three extravehicular activities (EVAs), or spacewalks. Since the tasks attempted during spacewalks on earlier flights proved difficult, NASA initiated a new approach to training for EVAs. Aldrin practiced using new overshoe-type foot restraints underwater in a pool in Baltimore. Dubbed the golden slippers, they were designed by McDonnell Aircraft to hold an astronaut near his workplace. The target vehicle launched Nov. 11 at 2:08 p.m. from Pad 14. About 90 minutes later, Gemini 12 launched at 3:46 p.m. from Pad 19. Before the docking took place,40 years ago: Gemini 12 launch on Veterans Day was final mission in the programa radar malfunction required the astronauts to consult intricate rendezvous charts, interpret the radar data themselves, and verify their computations with the spacecraft computer. Nevertheless, it was successful. The first and third EVAs supported photography and housekeeping tasks, with Aldrin standing upright in the open hatch of the spacecraft. The second EVA, however, was critical to demonstrating that work could be done in microgravity and required movement around the outside of the vehicles. On this spacewalk, Aldrin connected the Agena to the Gemini spacecraft. Then he completed various tool-handling and dexterity tasks in work stations, called busy boxes, stabilizing himself with the foot restraints and waist tethers. The tasks included torquing bolts, cutting metal, and coupling and uncoupling electrical connectors. When a bolt and washer floated free, prophetic of the problems encountered by astronauts assembling the International Space Station, Aldrin guided the weightless hardware into a corner of the box, capturing one in each hand. Lovell asked him over the intercom if he was playing orbital mechanics, to which he replied, Yes. I had to do a little rendezvous there. The five hours and 26 minutes of EVA time completed on Gemini 12 made Aldrin the U.S. astronaut with the most time spent outside an orbiting spacecraft. Lovell became the U.S. astronaut with the most space travel under his belt at 425 hours, 10 minutes. A stronauts James Lovell and Buzz Aldrin will celebrate the 40th anniversary of their Gemini 12 flight at the Kennedy Space Center Visitor Complex on Nov. 11 during a dinner to benefit the Astronaut Scholarship Foundation. Gemini 12 lifted off from Cape Kennedy on Nov. 11, 1966, and was the final flight for NASAs two-man spacecraft program. During the mission, Lovell skillfully maneuvered his Gemini spacecraft to dock with a target Agena vehicle, illustrating the art of rendezvous. Aldrin exited the capsule and performed a successful spacewalk, validating an activity that would be crucial for later lunar missions. Gemini 12 cleared the way for the ambitious Apollo flights that would take Lovell, Aldrin and 22 of their fellow astronauts to the moon.Lovell, Aldrin to celebrate Gemini anniversary at Visitor ComplexThese heroes, along with other space explorers, will talk with dinner guests and share their memories of flying on the last Gemini mission. Tickets to the dinner are now available at $150 each by visiting www.AstronautScholarship.org or calling 321-269-6119. Corporate tables are also available. The Astronaut Scholarship Foundation is a non-profit organization established in 1984 by the six surviving members of Americas original Mercury astronauts. Its goal is to aid the United States in retaining its world leadership in science and technology by providing scholarships for exceptional college students pursuing degrees in these fields. The foundation funds eighteen $10,000 scholarships annually and has awarded $2.3 million to 211 students nationwide.